Wilmette is a quaint village town in Cook County, IL, home to 27,000 at last check. A bedroom community nestled in the North Shore region, Wilmette is just 14 miles north of downtown Chicago -- enough space to feel peaceful yet close enough to the hustle and bustle of the city. It's a family town. In fact, Business Week ranked it as #7 back in 2007 as a great place to raise kids in the United States. It's got an eclectic mix of eateries, boutiques, shops, entertainment venues, schools, and a thriving commercial business sector. Thanks to a low crime and unemployment rate, coupled with short commute times and rich history dating back to 1880, it's no wonder so many people choose to put down roots in Wilmette. 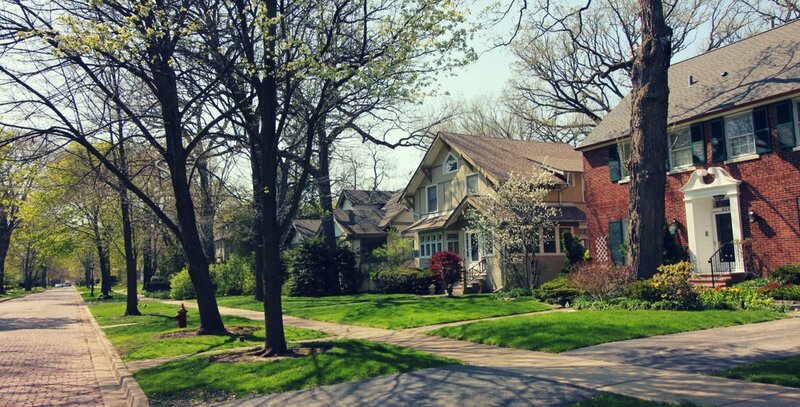 Featuring a low housing vacancy rate, Wilmette is a great place in which to live. The median sales price for homes in this community is $615,000, with a median rent at $3,000. With a wide mix of home types, from single families to townhouses, and ranches to mansions, Wilmette is home to desirable neighborhoods that appeal to all kinds of families. CAGE: Short for Chestnut, Ashland, Greenwood and Elmwood—with brick paved streets and close proximity to downtown Wilmette and the lakefront, this neighborhood is highly desirable to many. Kenilworth Gardens: Just a 10-minute walk to the train station, this is a great commuter neighborhood. It was developed in the 50s and 60s, bordered by Ridge Road, Iroquois Road, and Indian Hill. McKenzie Square: It's located within easy walking distance to the center of town, with two beautiful parks, Howard Park and Vaatmann Park. Indian Hill Estates: A single family home subdivision. East Wilmette: East of Green Bay Road in Wilmette, typically with higher home values than West. With high education expenditures per student, Wilmette features a fairly even blend of public and private schools. There are many attractions that keep people busy through all seasons here in Wilmette. Spanning 60 acres, this popular park is located at Sheridan Road and Michigan Avenue. A prime spot for swimming, bathing, and sailing, Gillson Park offers serene views of Lake Michigan. You'll also find a dog beach here, picnic area, lighted tennis courts, fitness course, tot lot, and even a lighted ice rink in winter. Located at 609 Ridge Road, this museum showcases the town's rich history through exhibits that explore, preserve, and share the history of Wilmette and the surrounding area. From sports and local legends to workshops, lectures and walking tours, there is something for everyone at Wilmette Historical Museum. From Ryan Field to Northwestern University, Wilmette is known for many local attractions. Commuting: Wilmette is within easy commuting distance for school and work. With excellent public transportation available, the Village is served by Metra Railroad service, CTA rapid transit service, and Pace bus service, with quick access to the Edens Expressway. Food: Whether you like Italian fare or Mexican, there's something to please every palate here in Wilmette. Check out the top 10 restaurants. Shopping: From the Village Center to Linden Square, you'll find everything you need in the many shops, boutique and malls here. Learn more about the Village of Wilmette here.